A survey grade UAV was used to capture the outside of the tower, without comprising detail on the upper floors. 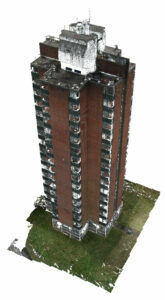 Point cloud data provided by Skeye BV, 3D model generated using Pointfuse. Following the Grenfell Tragedy in July, 2017, the UK Government tasked Dame Judith Hackitt with looking in detail into what can be done to prevent any future incidents, through legislation and effective management. Her final report, released in May 2018, declared current building regulations “not fit for purpose” and demanded an enforceable BIM mandate be applied to all high-rise structures. This presents not only a significant, multidisciplinary challenge to high-rise stakeholders, but also an opportunity for the industry to formulate a whole system solution, creating a framework from which all future projects can be based. A key challenge of this mandate is that it is likely to require Britain’s high-rise stakeholders to invest in both minor and major internal and external works, to ensure that at-risk buildings will comply with new, stricter fire safety legislation. For this to be achieved, it is important that stakeholders can find a solution that is cost effective and cost efficient, ensuring that the highest possible quality of work is achieved for the lowest possible price. Pointfuse meshes are lightweight, with objects and features automatically segmented from one another. In the above example, some walls have been selected, so they can be isolated, classified and exported independently, eliminating the noise (e.g. people and furniture) from the final 3D model. This keeps data sizes down, and provides a more accurate model from which all parties can work. The first step in delivering an effective BIM strategy for existing structures is to commission a detailed survey, which will be used as the base for any future designs and modifications. Utilising modern reality capture techniques is essential, as it would facilitate the creation of a highly detailed, highly accurate 3D representation of each structure. Reality capture on its own is not, however, the complete solution. Mass capture devices, such as laser scanners or UAVs produce highly detailed survey data in the form of a point cloud. 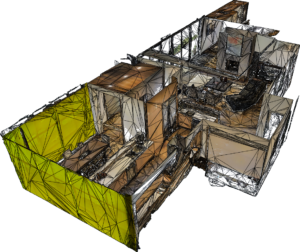 These point clouds are characterised by large data sizes, making them difficult to display, manipulate and share, as well as being full of redundant data. An essential step in the process is to use modelling software, such as Pointfuse and Autodesk Revit, to convert this data into a more useful and usable intelligent 3D model. Preventing costly hold ups during the construction phase provides the biggest and most obvious cost saving of any project. This can be easily achieved by using the model as a base for reviewing and coordinating any designs that have been created. Performing tasks such as clash detection ensure that any new fittings and features will fit into their existing surroundings, with any errors being identified prior to construction commencing. 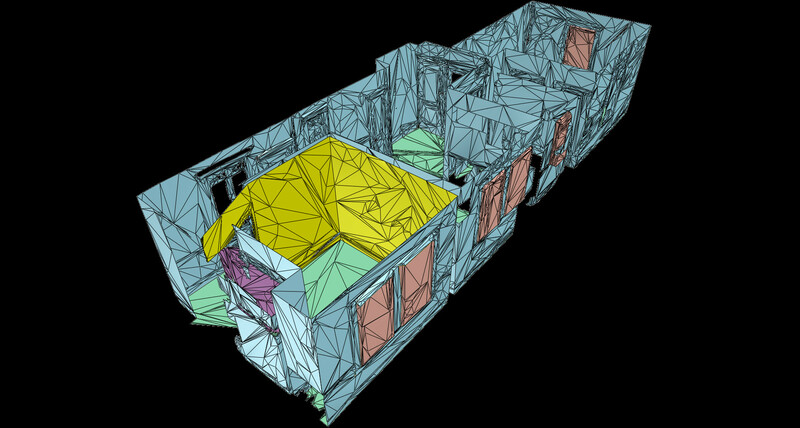 To date, the most practical method for segmenting a point cloud has been manual remodelling. This process, which can be a time-consuming task, is also susceptible to subjectiveness and human error, which limits the achievable accuracy. 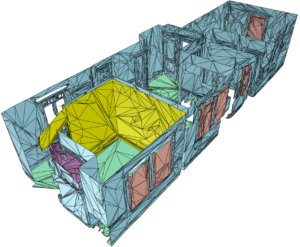 The automation of the process represents a significant cost saving, removing a substantial bottleneck from the project workflow while ensuring a highly accurate model is produced each time. Major works, such as the replacement of cladding or the implementation of sprinkler systems, require an accurate model, so they can be planned and costed effectively. Knowing the exact dimensions of the structure, means exact orders can be placed for any new cladding, or a sprinkler placement can be optimised based in existing conditions. This minimises costly overbuying without compromising safety. As all of this work can be performed digitally using the existing model, the number of site visits required by each trade is reduced, limiting disruption to residents while reducing risk for workers, ultimately saving time and money. The end goal for all this work is to ensure that Britain’s structures are safe for the residents that inhabit them. Using the model allows building owners to plan and implement new health and safety measures in a cost effective way, while also providing a way of documenting updates, proving ongoing compliance to the new legislation. Better still, the model can be provided to local emergency services, who can utilise it to produce predetermined attendance plans, ensuring a fast and effective response to any emergency situation. The BIM mandate demanded by Dame Judith Hackitt’s report issued a call to the industry to take ownership and responsibility for the buildings they are creating and maintaining. This has opened an opportunity to provide a complete and cost-effective solution to stakeholders, which can be translated to every high-rise structure in the UK, as well as globally. Using its powerful and unique modelling algorithms, Pointfuse is able to generate automated efficiency in the BIM workflow that will form the backbone of such a solution, cementing it as a vital tool in the hundreds of projects that lie ahead. Click below to view the full article or white paper, or email mike.deacon@pointfuse.com for more information.